So there I was in Red Deer in a hospital room not knowing the scope of what I was about to experience. For the pain I was put on heavy duty pain medications as they continued to run tests. Blood work to scopes down my throat and… Well you know where. In hopes of avoiding surgery the thought was to rest my bowels while in hospital and monitor. This created a lapse in judgment and foresight on the part of the doctors subositly looking out for me. My doctor went away on vacation, the Dr covering for him failed to ensure I was receiving nutrients. Even the nurses were pushing for the Dr to give me something. You have to remember I was incredibly sick, my family was in Calgary 2hrs away not knowing how serious it was. My girlfriend at the time “assumed” I was being looked after. It wasn’t until my mom. Came up to visit me in the hospital the day my doctor got back that the panic button was hit. All I can remember is feeling like an Auschwitz victim as the doctor removed the blankets and my mom gasped. Within an hour I was on TPN (Total Parental Nutrition) which is an IV that runs 24/7. Twelve hours of a white bottle that is the Essential Fatty Acids and a drip that provides the other nutrients. It was delivered through a Pick Line that was inserted through my arm and navigated internally until it dripped above my heart. 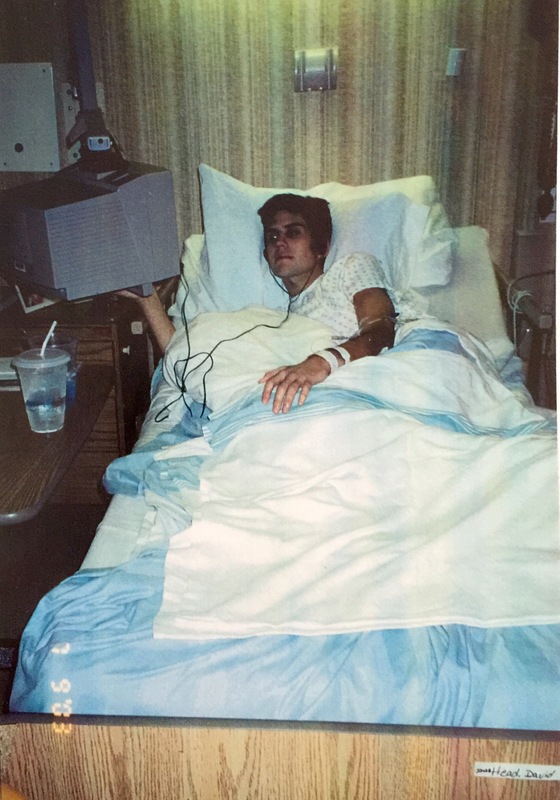 Shortly after I was given what was a new drug at the time called Remicade. They brought it via ambulance from up north. This was the last hail Mary to avoid surgery. All that I received from the treatment was the side effects. They gave me a peice of toast with jam to see how my body would react. Needless to say that was a very painful peice of toast!! That was the point my dad made it up from the US, he was strong in front of me until I was administered the Remicade. He sat next to me as they turned on the drip. I still remember the look of. His face as we both broke down. Once it was realized the treatment didn’t take I was asked to sign the papers for surgery. The only option was a “Sub-Total Collectamy”. They would remove the appropriate 5ft of deceased large intestine. They would then create a “Stoma” which is the other end of the small intestine. The Stoma would be brought out to the surface of my skin, stitched down on my right abdomen. It is called an Ileostomy as the Ileum is the medical term for the small intestine. A pouch would be placed over top for collection and protection. 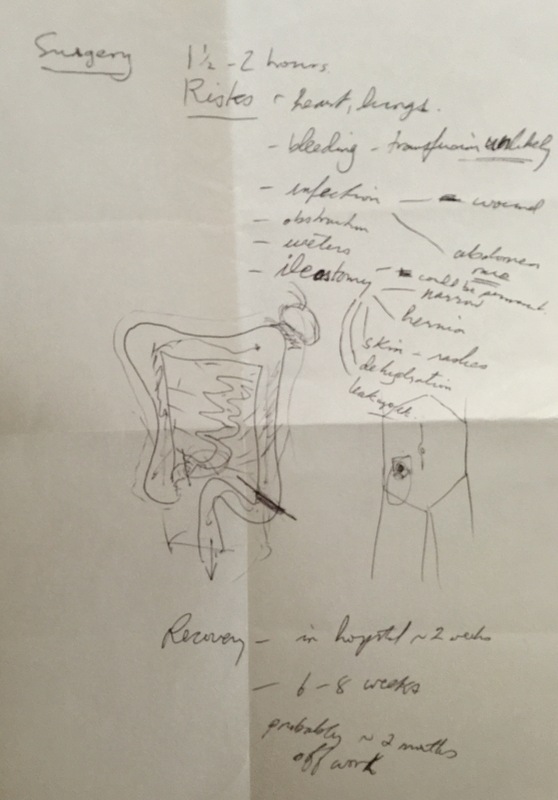 I can still see the doctor drawing this diagram of the surgery upside down at my bedside. As you can see he must have had practice thru the years. Now that you have the run down of the jist of what surgically had to take place I will share the uniqueness of how it went down for me. I still remember them giving me the Epidural in my spine in the operating room. The plan was it would be the best option for pain control post Op. I remember the Dr noting red marks on my back…. Which I will explain shortly. The next thing I remember is waking up in recovery in the most incredible pain one could Imagine. Just my luck, the epidural shifted and I literally woke up with zero pain control after just having 5ft of bowel removed! I then remember the staff using a backboard to move me into my room bed. The pain was uncontrollable. The residents on shift, this was 3am, could not provide anything stronger than Demerol until the attending came back on shift even after many phone calls. To this day I still see the room clock across the room. It said 4:05 when they gave me a shot of Demerol, I closed my eyes in hopes of opening them to the sunrise and the Dr. When I woke up from the pain it said 4:20am. This is how the whole night went along tuntil he attending acame in nd was able to put me on heavier pain control trough a PDA pump. On top of this, remember those red marks on my back? Turns out those red marks were shingles. And there is only one medication they can give that can only be given within 24hrs of onset to be effective. Because of the epidural fiasco I had past that benchmark. They still gave me the drug bit I had to be placed under quarantine….. I had never and have never felt as alone as I did at that point. They limited the visitors that could see me. When they did see me they had to wear full gowns, gloves, masks ect…. I felt like dying. After a week the quarantine was lifted. Then the reality of living the rest of my life with this bag on my stomach set in. I had incredible support from the ET Nurses who are specialized in ostomy care. 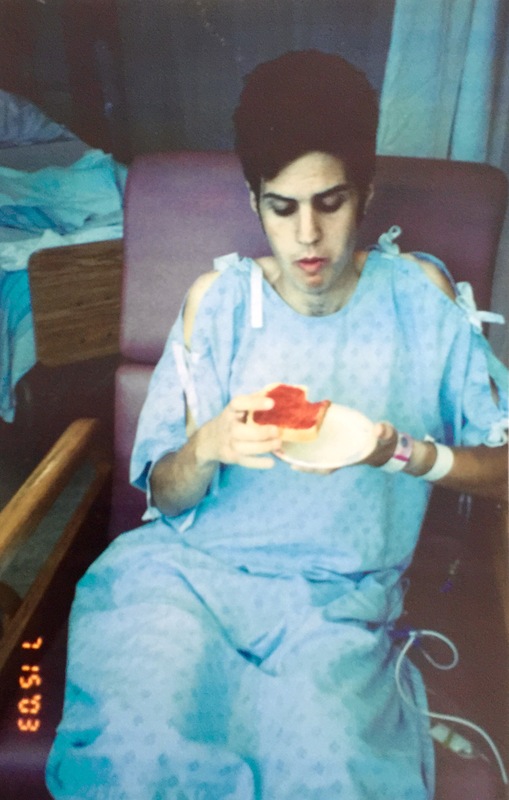 They got me in Contact with a man who had the same surgery at a young age to visit me at home after I was released. I’ll get in to what it was like coming home in my next post. Sorry if I bounced around while writing this post. This was one of the most emotional and difficult periods of my life. Just recalling all of this and writing it out its a toss up whether this or my diagnosis of Multiple Sclerosis or when I had Pyoderma Gangrenosum were the worst periods of my life. I’ll let you be the judge so to speak as I recount my life experiences so far in future blog posts. I hope this story helps people to understand how crucial it is to listen to your body and let go of your fears. Life is too short. I was 21yrs old when this happened. I have let go of the “what ifs” but at the time I was a mess with quilt for not seeing a doctor years earlier and admitting I had a problem with my gut. I took me years to overcome the quilt but it has made me into the man I am today. Next Next post: Home Time!